I am a straightforward person and very Simple. I always dream about performing Hajj and Umrah. I’m Honest and trustworthy and i believe in “be good to everyone”. I help everyone as much as i can. I always think about how to please ALLAH(SWT). I want my spouse to Love and prioritise ALLAH(SWT). 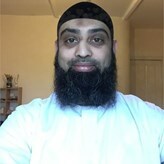 I like to watch Islamic videos and movies in my leisure time. i love spicy food. I enjoy cooking and Eating out. I learnt most things the hard way. you can figure out about me by this last statement. I am Diabetic. Jazāk Allāhu Khayran [“May Allāh reward you [with] goodness.”] My ALLAH(SWT) bless you with success in your search…. Aameen. إن شاء الله ... Off course Jannatul Firdous. As per worldly goals want to earn Halal and strive to be a good Muslim. Get more knowledge of Quran and sunnah and practice it. السلام عليكم ورحمة الله وبركاته First thing I'm looking in my future spouse is Deen. Have conscience of Allah(SWT) and fear ( جَشِىَ ربَّه) Allah(SWT). Who is striving for becoming good muslimah and who tries to preserve islam. And be true to herself. And knows her place and status as per Quran and sunnah.